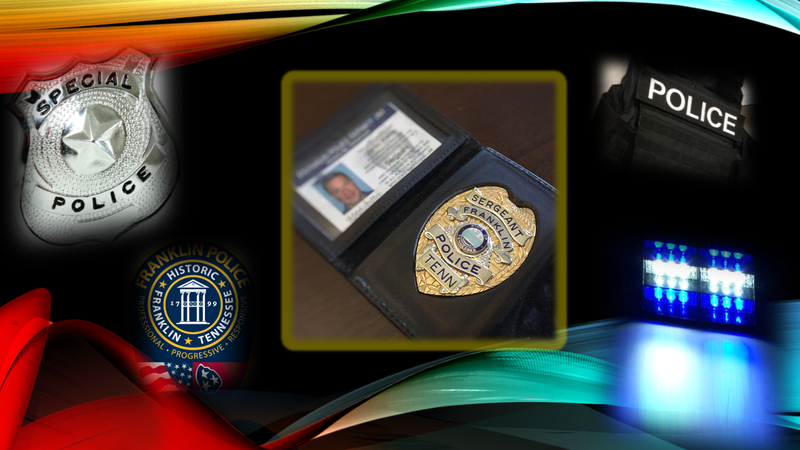 A legitimate police badge will always be accompanied by a photo ID, signed by the Chief of Police, identifying the holder as a commissioned law enforcement officer (as shown in center). Police badges and blue lights are meant to be symbols of trust and authority. In the wrong hands, however, badges and blue lights bought in stores and online can be used by criminals to trick victims. A badge clipped onto a belt or pinned in a wallet does not always mean that someone has police authority. If someone who is wearing a police ID vest, or who quickly flashes a badge tries entering your home or asks you to step out of your car, ask for their police credentials. All sworn officers in Tennessee are required to carry an identification card with their picture and signature of the Chief of Police, clearly stating that they are a commissioned law enforcement officer. No legitimate officer will ever hesitate to let you see and examine his or her credentials. A real police officer will never become upset about authenticating who they are. The Franklin Police Department uses a combination of uniformed officers in marked police cars, and plain-clothes officers in unmarked cars. None of our unmarked police vehicles has a single blue light on the dash. We use a combination of professionally installed emergency lights that can be easily seen 360°, and all of our vehicles are equipped with a siren. If you have any doubt about whether you are dealing with a real police officer, call 911. Dispatchers can easily authenticate if the person with whom you are dealing is a real officer, or an imposter. If you feel unsafe pulling over for an unmarked car, slow way down and turn on your flashers to signal to the officer that you see him. Pull over into a well-lighted area where others are present. You can also call 911 to ask a police dispatcher to verify that it is a real police officer pulling you over.